In January 15, 1908 the Province of Manitoba purchased the interests and facilities of the Bell Telephone Company of Canada and several other smaller private telephone companies, and created the Manitoba Government Telephone System (M.G.T.). The establishment of a public telephone system came as a result of increasing competition and erratic service. In Winnipeg, the result was that the single, over-taxed, Bell Exchange was soon replaced by satellite exchanges in various areas of the City. The St. John's Exchange building, together with Garry, Sherbrook, and West are the only surviving pioneer M.G.T. exchange structures. St. John was designed by Provincial Architect Samuel Hooper and constructed in 1910–11. Although many classical architectural elements were used in its design, Hooper created a somewhat subdued utilitarian appearance for the building in order for it to better fit into the neighbourhood in which it was located. In 1922 and again in 1947, the building was enlarged slightly and its interior altered to facilitate the installation of automatic user dialling equipment. The facility was officially closed in 1990. 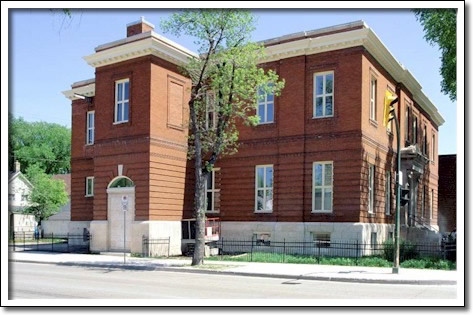 In 1993, the Winnipeg Housing Rehabilitation Corporation successfully negotiated for the purchase of the building.